Caked in soil (and in some cases rust) and covered in sap and plant gunk, my tools needed a good cleaning and conditioning. Not only is upkeep important for the longevity of the tools but disease can stay dormant in soil and plant material. The last thing I want to do is reintroduce disease to my plants in the spring. The supplies I used were a wire brush, steel wool, a whet stone, mineral oil and a clean cloth. You can also use a light sand paper to smooth out any wooden handles but my wooden tools didn't need that this year. Starting with the wire brush, I used it to remove any soil and tough rust from the metal surfaces. Next, I used the steel wool to remove any stubborn rust or stains. The whet stone has a rough side and a smoother side. Working with the angle of the blade, I sharpened all the cutting edges on the tools. This is especially important for the shovel and spade. 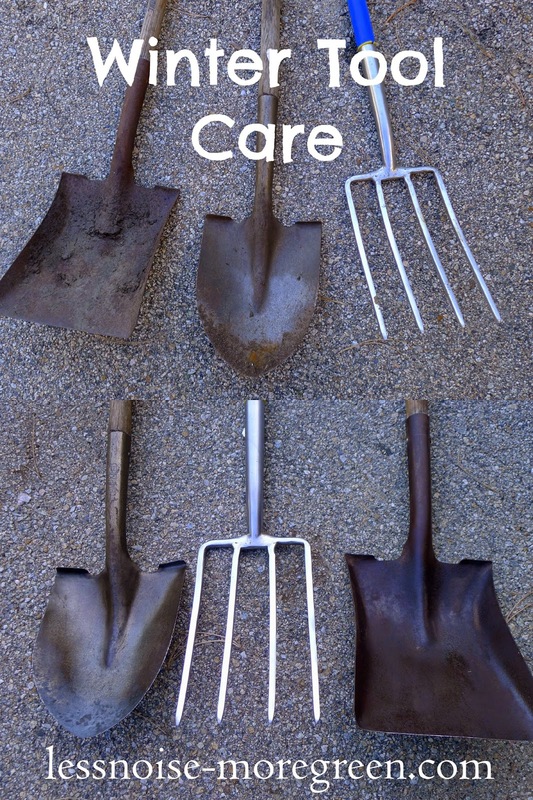 Did you know that most shovels and spades are dull when you buy them from the store? The shears received a sharpening, too. I used the steel wool again just to smooth out any jagged edges. All metal and wood surfaces received a coat of mineral oil for conditioning. I also applied a coat to the mechanisms and joints of the shears to keep them lubricated over the winter. Here is the result - what a difference! Clean, conditioned and ready for use in the spring. Tools that are dirty and dull can damage plants by not performing as they should, not to mention placing strain on your hands, arms, shoulders and back. I store my tools in my basement over winter as our garage floor becomes covered in snow and corrosive salt from the cars. If you leave your tools in the garage, you can provide additional protection by pushing the tools into five gallon buckets of sand mixed with 3/4 of a quart of mineral oil. They will be nicely conditioned when you need them. At minimum, store your tools off the ground. Cleaning tools is not the most glamorous job in the world but there are real benefits to making the effort and as a frugal and sustainable gardener, I want my tools to last!